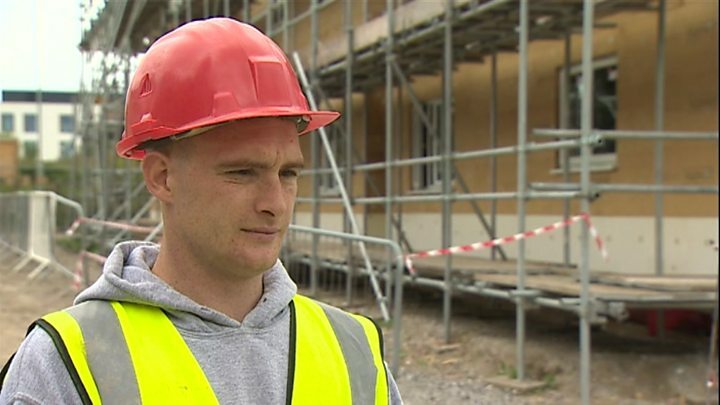 Homeless military veterans are helping to build their own homes in Wrexham, as part of a community project. It sees veterans working alongside professional builders and contractors to construct 16 new flats in the town. They will move into them once complete early next year. During the build, the veterans are taught new skills such as plastering and woodwork which aim to help them into employment. The Community Self Build Agency (CSBA) is the charity behind the project, which also involves a construction firm, a housing association and Wrexham council. The veterans are aged between 23 and 52 and served with regiments such as Welsh Fusiliers, Welsh Guards and Scotts Guards. Daniel Williams is one of them and was sleeping on the streets just a few weeks ago. He was diagnosed with post traumatic stress disorder after serving in Afghanistan. He said building his own home was the "best experience" he has had since leaving the Army. Mr Williams is going to college in September to study construction and said he was looking forward to "getting a trade at the end of it". Image caption Mr Bellamy said veterans can become homeless "through no fault of their own"
Mike Bellamy is a fundraiser for the CSBA and a veteran of the Royal Navy. He said homelessness among veterans was an ongoing problem in the UK. "After service, many find it difficult to adapt to civilian life. They've often lost financial security, medical care and some leave with injuries and mental trauma," he said. "Some end up unemployed, with family issues and then become homeless." Mr Bellamy said the veterans involved in the Wrexham build all have different backgrounds but he hopes at the end "they will have a sense of community" and "be able to rely on each other".